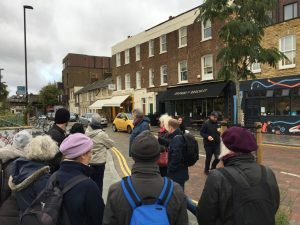 Never been one for working out whether the clocks go forward or back, so of course this last weekend, I had a bit of panic that I wasn’t going to be at the start of a walkshop in Brockley at the right time! As it happened I bumped into co-walkshop leader Paul Wood on the Overground, so I was reassured that I had got the right time! Brockley is the ‘heartwood’ of street tree warden volunteers. The neighborhood is not short of trees or green spaces, but many of the street trees are coming to maturity and may soon face the chop. Brockley Society has for many years recruited volunteers to look after trees in the streets. So many residents have signed up that they have now created Street Trees for Living as a separate NGO, working in collaboration with Lewisham Borough Council‘s tree officers. All over the borough (not just in Brockley) there are some 2000 empty street tree pits, but the council alone hasn’t the resources to plant and maintain trees. So, Street Trees for Living are galvanising residents to fund the purchase and planting of trees in their own streets. The Borough does the physical work of planting them, and the residents then maintain them as ‘juveniles’. 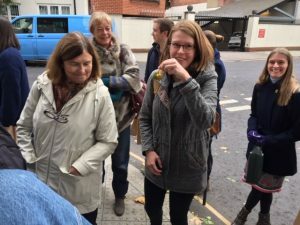 Xanthe Mosley is co-chair of Street Trees for Living and she and her husband joined our walkshop on Sunday, providing fabulous local information to complement Paul’s remarkable knowledge of street tree varieties. It is intriguing discovering which trees local residents choose to have planted in their streets – what influences their decisions we ask? Brockley station boasts a Persian silk tree, but other streets offer up sweetgums and several birch varieties. Many of the houses on the ridges running up to Hilly Fields (itself a fairly diverse parkland arboretum) have front gardens festooned with shrubs and trees – one example is this red barked strawberry tree. Neither Xanthe nor Paul quite expected to discover an elm surviving as a street tree! Elms in Lewisham, of which there is one in Ladywell, were decimated by Dutch Elm Disease in the 1970s, so it was terrific to find this elm tree thriving. 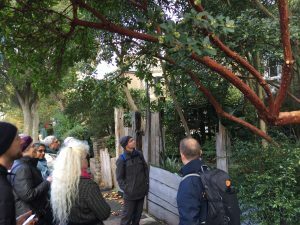 The weekend was a full on street tree extravaganza, as we had been commissioned by the Royal Horticultural Society to run two walks and a talk across their Urban Garden Show. 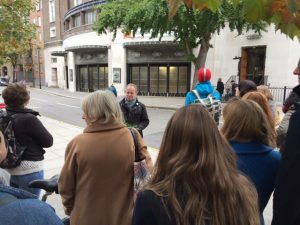 Each of the walks was an hour in duration, and Paul had worked out a circular route around the Horticultural Halls in Vincent Square. 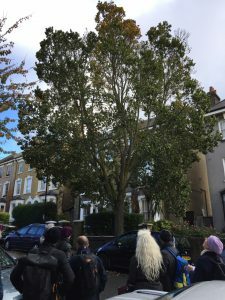 The route included the magnificent avenues of London plane trees in the Millbank estate, and participants learned just how smelly the fruit of a female gingko tree can be! We also found out the derivation of the term ‘Pom’ used by Australians to describe the English, and Paul bumped into the commissioning editor of his new book (out in May 2019). 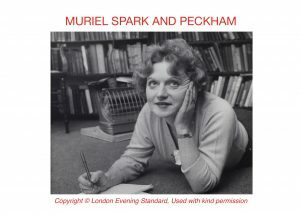 We have been prepping for our first “Between the Lines” walkshop coming up this Sunday 4 November in Peckham, celebrating the life and work of Dame Muriel Spark,who wrote an intriguing novel called ‘The Ballad of Peckham Rye‘ . Many of the locations mentioned in the novel still persist so the plan is to walk to some of these and read and discuss her book. Why not come and see Peckham in the 1950s (when the novel was set) and see for yourself? Read more and book here. 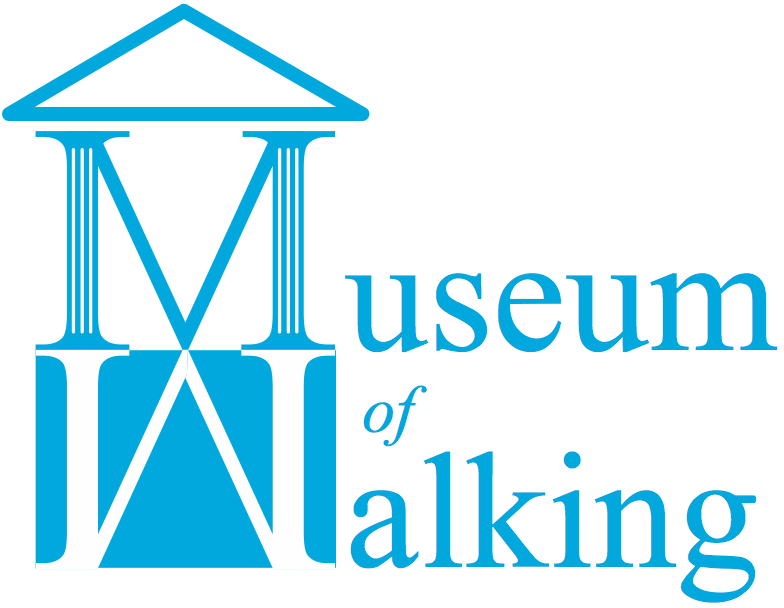 This last week, catching up with the Talking Walking archive, I have been listening to a variety of voices whom it would be difficult to categorise under one label, unless that label was ‘passionate walker‘. I was in the Apple Store in Regent Street about to join a workshop on using Garageband (the sound editing suite bundled in with Apple computers, which to this day is what I use for producing these podcasts) when I met Graham Stevens, who was having difficulty closing his computer down. I offered to help and we got to talking, and it turned out that not only was he an artist and film maker but one who was passionate about walking – not just any walking, but walking on water! Well this piqued my interest and in researching the Internet, I uncovered a video in the archive of the National Library of Scotland. It showed a large polythene cube in which two people walked, causing the cube to move forward, one side at a time, and as it moved forward down hill, one realised that the cube would end up in a lake if the people within weren’t careful. Well that was of course, their intention! Once the cube came to the water, the people within it just kept walking, and indeed walked on the water, to the far side of the lake. A very much younger Graham Stevens emerged and was interviewed about his experience. I sent the link to Graham who told me he had never seen the video! Graham invited me to join him on a walk on the Isle of Wight, where he had created the ‘Freshwater Dialogues‘ a series of walks in honour of Robert Hooke (inventor and town planner) who was born in Freshwater. The intention of the walks were to visit sites that would prompt discussion about Hooke and about walking on water, air and fire. Cannily Graham had got funding from the Royal Society marking their 350th anniversary – for whom Hooke was a founding member – and had been invited by local art gallery, Dimbola, to display photographs of his work from the Rock Festival in 1970. 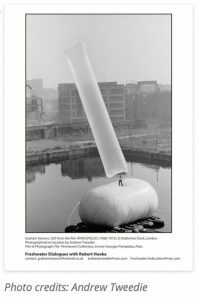 At that time, Graham had created an inflatable tube of vast proportions, that was passed from hand to outstretched hand by the rock festival crowd, creating an extraordinary image and film of ‘crowdsurfing’. Only a few months earlier, Graham had been approached by Andrew Tweedie, a photographer who recognised Graham from when he had been studying photography at college, and had taken Graham’s art works as the focus of his photography dissertation. Andrew had leapt negatives of photographs of Graham’s work from the 1970s (including from the Rock Festival), such that these photographs could shown at Dimbola. An amazing story and an amazing artist, and delightful company on a walk across the top of the Isle of Wight – a treat to make and a treat to listen to. 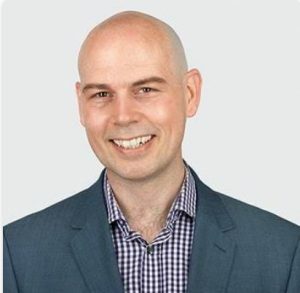 Listen here to Graham Stevens Talking Walking. Phoebe Taplin recommends you take a dog zappa next time you follow one of her walks. Although she now lives in Bishop Stortford, I interviewed at the time of the publication of her walking guide books to Moscow. 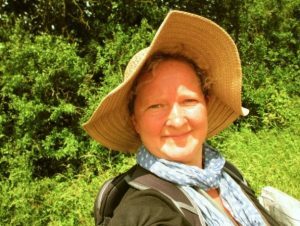 She has since written guides to walks in Hertfordshire, London and the Thames Valley, where it less likely you will encounter packs of wild dogs. Resourceful Phoebe realised she could cover more ground and write more walks, if she recruited friends to join her, thereby creating a regular walking group, that expanded in number immediately her walks began appearing in an English Language weekly Moscow paper. In all she devised more than 50 walks in Moscow – take a look at her Talking Walking page to follow links to her books, and listen to Phoebe explaining how she landed what she sees as her ‘dream job’ as a walking route devisor. Adam Shaw had worked on the front line of the NHS for more than a dozen years as a nurse in a heart ward. Listening to heart disease sufferers he began to realise how little they knew of how to change their lifestyles to prevent heart disease, attack or imminent death. He looked into alternative medicine, becoming a Reiki master, yet found that walking was often seen as the best prevention to heart disease. He consequently combined energy healing with walking, devising a simple process through which participants can become grounded and lower their stress levels, as well as taking moderate physical activity, calling it “Walk Innovation“. I came across Adam when working on behalf of the NHS on workforce development and invited him to present Walk Innovation at a Talk the Walk hosted by Greenwich Healthy Living Service. Well worth a listen. Katrina Naomi is a poet, currently in residence at the Leach Pottery in St Ives. She is passionate walker so much so now, that she felt to really be prepared for any eventuality, it was important to her to train as a mountain guide. Frequently, clients assumed that she wasn’t the guide! We walked together across Streatham Common towards The Rookery, at the time she was living in London. Now in Cornwall, she was recently commissioned by BBC Local Radio to compose a poem for National Poetry Day. Listen to Katrina on Talking Walking here. Dare I describe Foster Spragge as an obsessive? 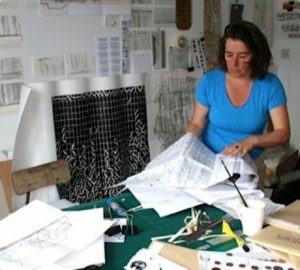 Her art is made through almost constant repetition, criss crossing the City of London, marking every step with a pencil mark on an unfolding square of paper. Each city she encounters has a unique ‘signature’ created through her repetitive walks. Listen to Foster’s interview on Talking Walking. 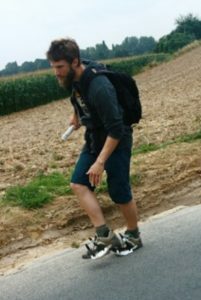 Trying to move further into recording the path one treads, this time trying to devise a simple process for a tactile interpretation of the landscape, Belgian artist Reg Carremans walked 375kms across Flanders with canvas on the soles of his shoes. It was only the third day of the month long nomadic Sideways 2012 art festival, when I recorded this interview, so Reg’s shoe adaptations hadn’t yet been tested on the roughest surfaces. Yet he was very confident that not only the canvasses and the shoes would survive the adventure, but so would he! He was a companion on many more kilometres of the festival and we became allies and friends. I have lost touch with him since, and only have this recording and a couple of newsletters he sent me, but I am hoping that one day soon our paths will cross again. Have a listen to Reg Carremans Talking Walking.